Alternative management strategies for localised prostate cancer are required to reduce morbidity and overtreatment. The benefit of exercise and the impact this has upon disease progression/mortality outcomes has been supported by non-randomised studies. 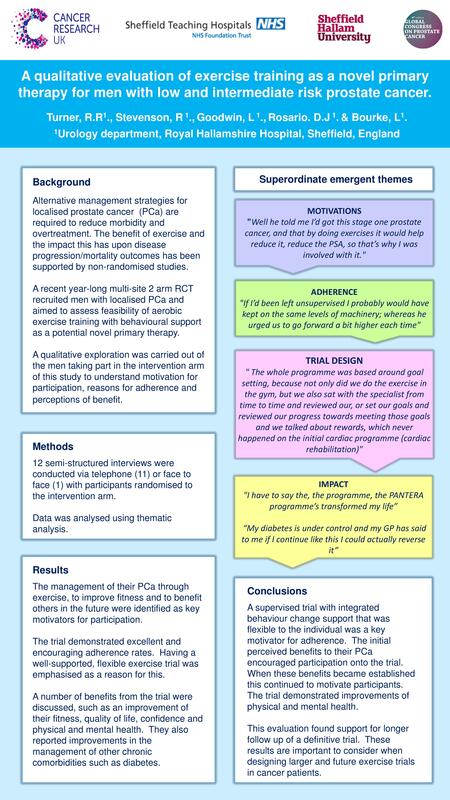 A recent year-long multi-site 2 arm RCT recruited men with localised PCa and aimed to assess feasibility of aerobic exercise training with behavioural support as a potential novel primary therapy. A qualitative exploration was carried out of the men taking part in the intervention arm of this study to understand motivation for participation, reasons for adherence and perceptions of benefit. Twelve semi-structured interviews were conducted with participants randomised to the intervention arm. Interviews lasted approximately 30-45 minutes and were carried out either via the telephone (11) or face to face (1). Transcripts were double coded by study researchers. Data was analysed using thematic analysis. The management of their PCa through exercise, to improve their fitness and to benefit others in the future via this research were identified as key motivators for participation in the trial. The trial demonstrated excellent and encouraging adherence rates. Having a well-supported, flexible exercise trial was emphasised as a reason for this. The use of integrated behaviour change support such as goal setting was highlighted as engaging. A number of benefits from the trial were discussed, such as an improvement of their fitness, quality of life, confidence and physical and mental health. They also reported improvements in the management of other chronic comorbidities. As these benefits became established, this encouraged the men to continue with exercise after the trial was complete. Having a supervised trial with integrated behavioural support that was flexible to the individual was identified as being a key motivator for adherence. Additionally, the initial perceived potential benefits such as the management of their PCa encouraged participation onto the trial. These motivations continued throughout the trial when the benefits became established for the individual. The evaluation also found support for longer follow up of a definitive trial. These results are important to gain an understanding of how to encourage and support survivors into exercise and crucial when designing future and larger scale trials.